" ... a much-needed corrective to a badly distorted mainstream narrative of a key event in the history of the left and African-American politics of the late ’60s ... It is now clear that Hampton and Clark were victims of a plot hatched by the FBI and executed by the Cook County State’s Attorney and Chicago police officers. Nonetheless, conventional wisdom portrays the Panthers as the villains. ... This book should alter the conventional wisdom that the Panthers were a dangerous threat that the police had to eliminate at all costs ... "
It’s clear that Hoover’s designation of the Panthers as ‘the greatest threat to the internal security of the country’ provided law enforcement with a virtual license to kill. Jeffrey Haas tells a story that many of us have long waited to read. 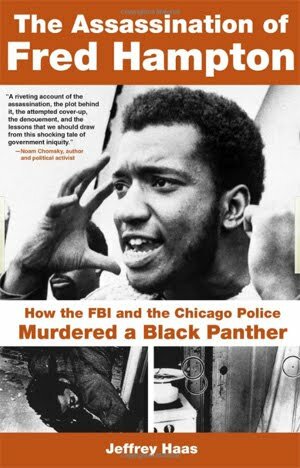 His book, The Assassination of Fred Hampton: How the FBI and the Chicago Police Murdered a Black Panther (Lawrence Hill Books, November), is a much-needed corrective to a badly distorted mainstream narrative of a key event in the history of the left and African-American politics of the late ’60s. Haas reveals just how deeply the Nixon Justice Department was involved in the Chicago police raid on December 4, 1969, that killed Black Panther Party leaders Fred Hampton and Mark Clark. Hampton headed the Panthers’ Chicago branch and Clark the Peoria, Ill., branch. It is now clear that Hampton and Clark were victims of a plot hatched by the FBI and executed by the Cook County State’s Attorney and Chicago police officers. Nonetheless, conventional wisdom portrays the Panthers as the villains. In 2006, Chicago’s City Council, under pressure from the Fraternal Order of Police, voted down a routine city ordinance to name the block on which Hampton’s murder took place in his honor. The accumulation of facts presented in Haas’ book portrays Chicago police as all too willing to violate the constitutional rights of Panther members and supporters. He reveals the cynical treachery of State Attorney Edward Hanrahan, whose office planned the raid under the direction of J. Edgar Hoover’s Counterintelligence Program (COINTELPRO). Haas also provides a damning portrayal of one obstinate judge’s continued attempts to thwart the legal process. But Haas also offers captivating details that add color and context to those turbulent times. He evokes the infectious spirit of change and activism that infused so many idealistic young Americans during the hallowed ’60s. His accounts of growing up Jewish and middle-class in Atlanta, Ga., help locate the source of his unconventional political leanings. Haas’ grandfather, for example, was an attorney for Leo Frank, a Jewish factory owner who was lynched in Georgia after being wrongly accused of murdering a teenage girl. His father was deeply involved in the civil rights movement in the South. Rep. John Lewis (D-Ga.), an icon of that movement, wrote the eulogy for his father’s funeral. Haas’ forebears held radical positions for Southern whites, and it seems Haas was simply following ancestral footsteps when he aligned himself with the emergent black radical movement of the 1960s. Although many thought it unusual for an attorney with University of Chicago credentials to eschew wealth and status to associate with black radicals, it was a natural move for Haas. His accounts of the life at the U of C law school, where he met a “persuasive” Bernardine Dohrn, who would become the leader of the Weathermen faction of Students for a Democratic Society, evoke a period infused with political passions. At that time, Dohrn chaired a group that sent law students to the South for summer jobs with civil rights lawyers. Haas was sent to his home, Atlanta. “I had to go to Chicago to take my first steps to confront segregation where I grew up,” he writes. Though easily parodied, the earnest idealism of those days provoked real change. Haas’ volume reminds us how important naïve and optimistic students were to toppling barriers of segregation in the South. Back in Chicago, after passing the bar and while defending suspects arrested during the violence that erupted following the 1968 assassination of Dr. Martin Luther King, Jr., Haas met a like-minded attorney named Dennis Cunningham. 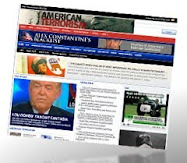 They formed a friendship and partnership, and in 1969 they joined with two other lawyers to open the People’s Law Office, which has since gained an international reputation for conscientiously defending victims of overzealous law enforcement. Haas also provides some historical context for the rise of the Black Panther Party, a group started in 1966 by college students Huey P. Newton and Bobby Seale to address issues of police brutality in their hometown of Oakland, Calif. Seale and Newton decided to form an organization of armed volunteers to confront abusive police officers directly. At the time, it was still legal to brandish unconcealed weapons in California. The idea that African-Americans could physically resist police mistreatment was very attractive to urban black youth of that era. I was one of them. And, like me, many had grown weary of watching nonviolent protesters for civil rights endure humiliating beatings at the hands of police. The Black Panther Party’s disciplined audacity offered black youth an alternative that resonated with the militant tenor of the times. Although the group embraced a quasi-Marxist ideology and provocatively challenged police authority, it spread like wildfire—mostly in the urban north. 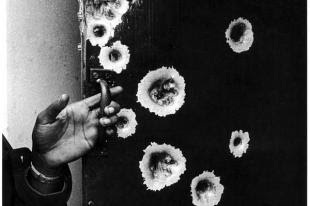 Their urgent sense of commitment to social justice permanently altered the street-gang culture of urban America. 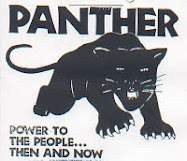 The first Panther office opened in Chicago in November 1968. Fred Hampton, a charismatic 20-year-old who formerly led the Maywood, Ill., NAACP youth chapter, was given the leadership role by Bobby Rush, now an Illinois congressman, but then the Defense Minister of the Illinois Black Panthers. Haas gives us one of the few accounts of Hampton’s life outside of his connection to the Panthers. Hampton grew up in Chicago’s southern suburbs, the third child of Louisiana immigrants Francis and Iberia Hampton. The true strength of this book is Haas’ meticulous reconstruction of the particulars that led to the partial victory (the plaintiffs received a $1.85 million settlement, although the government admitted no wrongdoing) and legal vindication of the People’s Law Office. He details how the FBI, the Cook County State’s Attorney’s office and the Chicago police conspired to assassinate Fred Hampton and Mark Clark. He clearly reveals, for example, how COINTELPRO, which sought to “neutralize” black leaders, provided motivation for the Hampton murder. The book’s exhaustive account of this incident is one of the few investigations to explore the Hampton assassination. This is odd because many strands of U.S. history converge at this point. 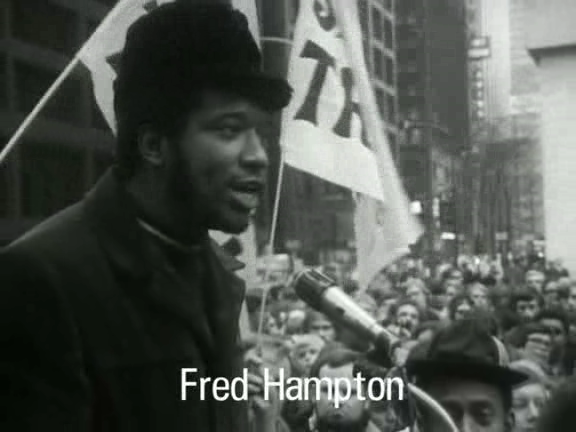 The FBI’s COINTELPRO program, uncovered in 1973 by the Senate Select Committee on Intelligence, chaired by Idaho Senator Frank Church, sought to “prevent the rise of a messiah who could unify and electrify the militant Black Nationalist movement.” That FBI directive helps us understand just how deeply the federal government feared the Black Panthers and someone like Fred Hampton. A popular leader with great potential, Hampton embodied the electrifying appeal of the Black Panther Party among a certain segment of black youth. In retrospect, it’s clear that Hoover’s designation of the Panthers as “the greatest threat to the internal security of the country” provided law enforcement with a virtual license to kill. What’s more, the reckless bravado of the Panthers often provided police a convenient pretext. Haas’ important book clarifies how the racial paranoia of an out-of-touch federal government produced a deceitful policy that trashed constitutional rights even as it ignored legitimate grievances. This book should alter the conventional wisdom that the Panthers were a dangerous threat that the police had to eliminate at all costs. Haas reveals that the cost was much too high.